Google recently released a new app for iOS called Gboard which expands the keyboard with a built in search engine. With Gboard Google makes it possible to search without a browser. Instead of leaving the app you’re currently using and opening another app to google something, with Gboard switching apps becomes unnecessary. Gboard is the outcome of Google combining the iOS keyboard with its own search engine. Even though Google already offered one of the easiest ways of online searching for the past decade, they found a way to make it even easier. With Google search, Google accomplished a dominant position in the online search market. For the past ten years a lot has happened in the evolution of technology and especially the launch of the first iPhone in 2007, fusing mobile and web information, caused a whole new classification of the web. Up until the release of iOS 8 Apple didn’t allow the use of any third-party keyboard, but as soon as Apple opened their ‘gates’ Google jumped in, aiming for a prominent position on the iPhone. “Searching and sending stuff on your phone shouldn’t be that difficult. With Gboard, you can search and send all kinds of things—restaurant info, flight times, news articles—right from your keyboard” (Patel). Gboard is not the only third-party keyboard available in the App store, but it is the first one with a promising shot at reaching the mainstream. Mainly because Gboard has the capacity to make smart phone use a lot more efficient. The built in search bar makes multitasking on the iPhone both easier and quicker. Visually Gboard isn’t very different from the default iOS keyboard, apart from the colorful ‘G’ at the keyboards’ top left corner. When tapping the Google logo, the search bar appears on top of the keyboard. Gboard’s search bar functions in any app. This means users can look up anything right from their keyboard without ever leaving the app. When using a computer, switching between different tabs or apps is no big deal but the combination of a small screen and a virtual keyboard can even make looking up an address a hassle. For example: when in a Whatsapp group chat, you are proposing to have dinner at a certain restaurant and one of your friends asks for the address. Without Gboard this means you have to close Whatsapp, open up Safari, type in the name of the restaurant, find the address in the different search results, open the link, copy the address, close Safari to then open Whatsapp again, copy the address and finally send it. Gboard saves you from taking almost all of these steps: just tap the G to make the search bar appear on your keyboard, type in the name of the restaurant, press ‘search’ and then tap the result to send it. The results are presented in a card-style layout at the bottom of the screen. When tapped, the information from the card appears in the text entry box ready to be sent. This way you send the information as hyperlinked text which allows the receiver to open up the location in Google Maps or call the restaurant just by tapping the information. It’s also possible to send the actual card by tapping the ‘paste’ button. Besides this extremely convenient new way of searching, Gboard also includes GIF search. By tapping the emoji icon and switching to GIF at the bottom, you can either choose from a range of preselected GIFs or search for a GIF using keywords. Google also improved the emoji section: instead of manually scrolling through all the different emojis, Gboard does the searching for you. Finally, Gboard offers Glide Typing, which lets you type words by sliding from key to key instead of tapping so, according to the official Google blog, “everything you do is just a little bit faster”. With Gboard belonging to Google and therefore allowing Google to become deeply integrated with the keyboard unsurprisingly raised a few privacy related questions. As already said by Siva Vaidhyanathan back in 2011 it’s important to keep in mind that Google is a commercial company: “We are not Google’s customers, we are its product. We – our fancies, fetishes, predilections, and preferences – are what Google sells to advertisers” (p. 3). According to the app description in the App store Google is well aware of the fact that privacy has become an important issue: “We know the things you type on your phone are personal, so we’ve designed Gboard to keep your private information private”. More specifically “Gboard will remember words you type to help you with spelling or to predict searches you might be interested in, but this data is stored only on your device. This data is not accessible by Google or by any apps other than Gboard,” as stated in the app description. So according to Googles’ statement users shouldn’t be worried about their privacy being violated when using Gboard. This means that, for now, users can safely enjoy Gboard, but ofcourse it’s always important to keep Siva’s statements in mind. “Did Google Make the Best iPhone Keyboard Yet? Meet Gboard.” MakeUseOf. N.p., n.d. Web. 19 Sept. 2016. “Gboard — Search. GIFs. Emojis & More. Right from Your Keyboard. on the App Store.” App Store. N.p., n.d. Web. 19 Sept. 2016. “Meet Gboard: Search, GIFs, Emojis & More. Right from Your Keyboard.” Official Google Blog. N.p., n.d. Web. 19 Sept. 2016. Perez, Sarah. 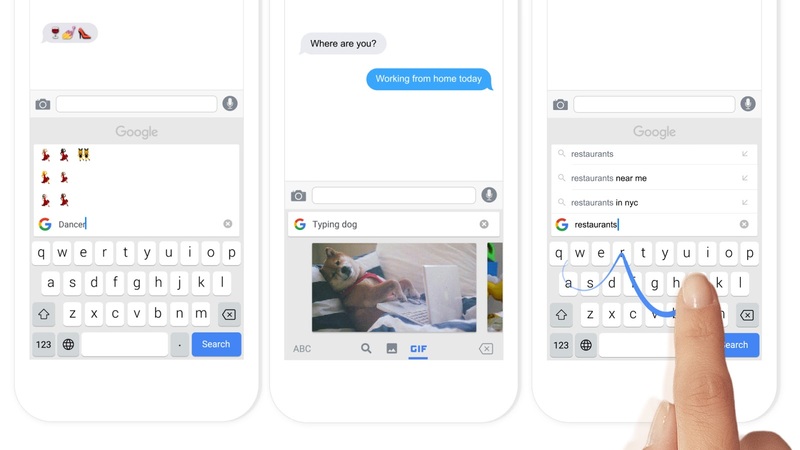 “Google Launches Gboard, an iOS Keyboard That Lets You Search without a Browser.” TechCrunch. N.p., n.d. Web. 19 Sept. 2016. The Googlization of Everything. N.p. www.ucpress.edu. Web. 19 Sept. 2016. Wong, Raymond. “Google’s New iPhone Keyboard Puts Search, Emoji and GIFs Front and Center.” Mashable. N.p., n.d. Web. 19 Sept. 2016.